Known by many as the "gentle giant" of Amazon parrots, the mealy Amazon is a docile, easy to train bird that can be an excellent pet. These beautiful, large birds may not have the flashy colors of other parrots, but their loving, friendly personality makes up for that. They are a good choice for bird owners who want a large parrot but would prefer one with a laid-back attitude. 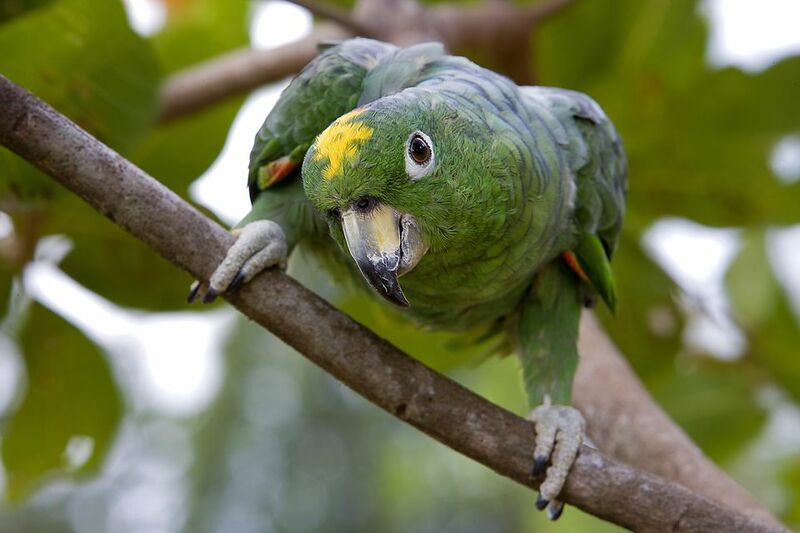 The Mealy Amazon is native to Central America and South America. Their range extends from southern Mexico to parts of Bolivia and Brazil, including the countries of Peru and Colombia. The birds call the woodlands and tropical rainforests of these areas home. They're often found in large flocks that can reach over 100 birds, though mating pairs will fly off to find a tree cavity to nest in come breeding season. An easy food source, Mealy Amazons are known to ravage farm fields and are known as pests. Farmers can often be seen waving off and making a lot of noise to scare off a flock that's passing by their crops. Mealy Amazon parrots are among the largest Amazon parrots and average 15 to 17 inches in length from the beak to the tip of the tailfeathers. Full-grown, they typically weigh between 1 and 2 pounds. It's not uncommon for them to grow larger than this, though. In captivity, this species can live for 60 to 70 years with proper care and a well-balanced diet. Adopting this parrot is a lifetime commitment and not one to take lightly. Mealy Amazons are known to be the most gentle and docile of the Amazon parrots. They are affectionate when kept as pets and form strong bonds with their owners. This stems from their natural instinct to form a monogamous, lifetime pairing with their mate. Similarly, they love to interact with their human flock. Many owners say that the bird will simply wander around looking for someone who can give them attention. When they find that family member, they'll wait patiently to be picked up or played with. Generally, they are not an aggressive bird. In fact, they're often called "non-nippy Amazons" because they don't nip or bite often. They tend to get along with other birds as well. When it comes to vocalizations, Mealy Amazons are large so their screams can be very loud and carry a long distance. Yet, they will not yell out as much as some feistier parrots. These birds are excellent talkers and can pick up a diverse vocabulary. It's quite comical to listen to them repeat phrases using different inflections every time. Mealy Amazons are mostly green, with darker shades toward the top of the body changing to a lighter lime green toward the tail. They are distinct from other parrots because of a grey-green pattern along the nape of the neck and back. It looks as if the bird was dusted with flour, which is how it gets the "mealy" name. The species' other common name, blue-crowned parrot, is due to a blue patch that's often seen on the crown. On some birds, this may be more of a purple color and some have a patch of yellow on their forehead as well. These birds also have bursts of red and blue on the edges of their feathers and flesh colored legs. Their beaks range from horn- or yellow-colored to dark gray and they have a featherless white ring around the eyes. Amazon parrots thrive on social interaction, and they need it to remain healthy and happy. Birds that are neglected often fall into destructive behavior patterns and depression. This can manifest itself in various physical and emotional problems, including biting and feather plucking. It's important for mealy Amazon owners to set aside a period of time each day for one-on-one interaction with their bird. Not only does it help the bird remain tame, it also establishes and maintains a healthy bond. Essentially, the bird just wants to be near you. This makes training easy and they love to sit on shoulders so they can be part of the action. While hand-fed Amazon parrots normally make loving, affectionate pets, many go through a hormonal bluffing stage during adolescence. This can bring with it aggressive tendencies that some owners can't handle. While the phase does pass, it can sometimes last for up to two years. For this reason, they are often recommended for experienced bird owners. Overall, if you learn your bird's personality and work on forming a solid bond, the mealy Amazon can become a well-trained pet. Just be sure you can fully commit to his needs and are able to afford the costs associated with keeping a large parrot. If you think a mealy Amazon might be the right bird for you, contact local breeders to see if you can schedule a visit to meet their birds. Observing the behavior of mealy Amazons in their home environment will help you decide whether or not this species is a good choice for your lifestyle. Like all Amazon parrots, mealy Amazons do best on a high-quality pelleted diet, supplemented with seed mix and daily servings of fresh bird-safe fruits and vegetables. A fresh and varied diet will help ensure that your bird maintains top nutrition. Amazon parrots are prone to excess weight gain, so it's important that they are allowed room to exercise every day. If you want a mealy Amazon, you should be able to give it a minimum of three to four hours outside of its cage per day. This will allow the bird to burn excess calories and stretch its muscles, on top of providing essential mental stimulation. The bird's cage should also allow room to move and explore with ladders, a perch, and other interesting elements. Providing bird-safe toys is going to keep the bird occupied while inside. It's often good to rotate toys to prevent boredom and, since they do like to chew on things, gives him an outlet other than your furniture to take care of that instinct.